Special Kindle Price - only 99 cents! What happens when an ordinary weenie dog consumes a pile of magic beans? She turns into a super hero. Introducing...LUCY THE WONDER WEENIE! Lucy the Diva Doxie irritates her family with an obsessive licking habit. Then one day she consumes a pile of magic beans and something extraordinary happens. 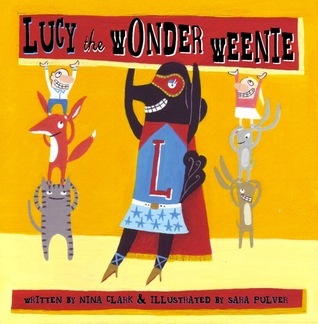 She transforms into LUCY THE WONDER WEENIE. After adopting her new super hero persona, Lucy makes a startling discovery. Her bothersome habit has the power to comfort tearful children and create laughter, love, and joy. NINA CLARK has been surrounded by wiener dogs since the age of ten, starting with Max, a large dachshund who resembled a loaf of peasant bread. Since then, there have been large weenies, small weenies, smooth weenies, and long-haired weenies. All of them had sausage-like figures, ear-bursting barks, and serious attitude. Nina currently lives with Lucy the Diva Doxie outside of Boston, Massachusetts. Nina, Papa Carl and The Kidlets are the lucky recipients of Lucy's obsessive compulsive licking disorder. Lucy, an adorable dachshund, has an issue with licking, she licks everyone and everything. She also has a very dachshund habit of eating first, asking questions later. Anyone who has ever owned or been owned by a dachshund will understand these facts. So when Lucy's licking and eating habits cause her to consume some beans, which just happen to be magical, magical things start to happen. She develops super powers which helps her battle bullies! Whimsically illustrated, this dachshund tale will be sure to please any child or those owned by dachshunds! This should be on any dog lover's book shelf.